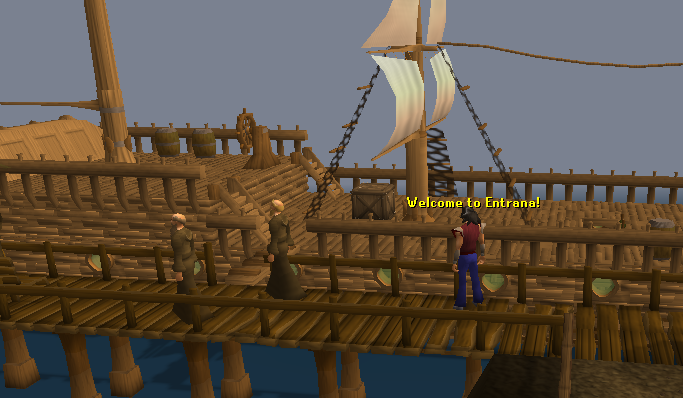 Entrana is a peaceful island that is home to the Monks of Saradomin. 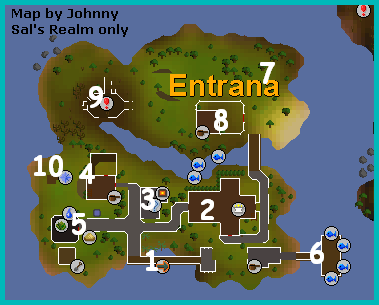 Entrana is featured in many quests, and is also known for the vast amounts of Crafting XP that can be earned there. A few other attractions include a Church, a Dungeon and a Herblore shop. Here you will be shown around the attractions, people, shops and more that can be found on this wonderful island. This is a little warning before you go onto Entrana, you cannot take any weapons or amour with you, only supplies to make them, like arrow shafts and arrow tips. You are allowed runes, however. 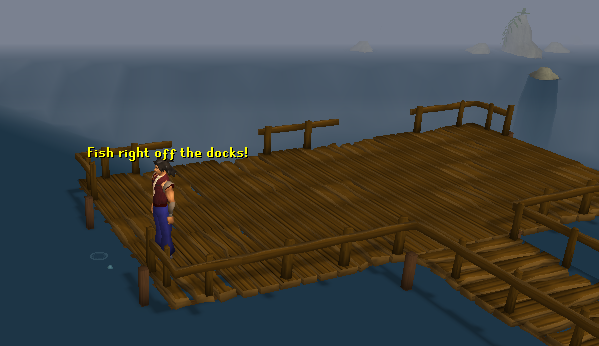 You will need to talk to a Monk at the northern most docks of Port Sarim. He will ask you if you want a trip to Entrana. Say yes, and he will search you for weapons and armour. Once he's finished, you will be taken on the boat to Entrana. To do this method, you need access to the Abyss, which requires the miniquest the Zamorak Mage. When you are in the Abyss, exit via the law rift and you will be in the law altar. Take the portal exit and you'll be on Entrana. Incase you forgotten, you cannot take weapons and armour into the law rift. You do not need 54 Runecrafting to enter the rift. This method requires the completion of the quest Enlightened Journey. You will need to have unlocked the route first from Entrana to where ever you want to take the balloon from. This method requires one normal log. This area is marked by the arrow transport sign found on the minimap. On the dock are three NPCs, each one called Monk. 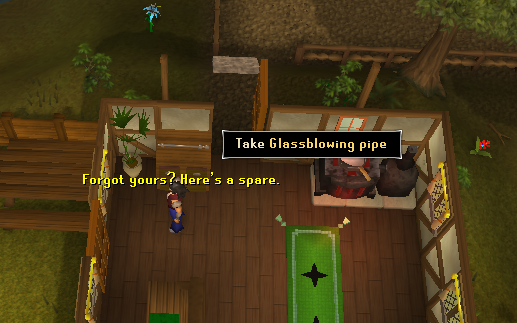 They can take you to Port Sarim for free if you talk to them. There is nothing on the boat apart from pretty pirate scenery. This holy place is home to more Monks. The Monks are level 5 and can be attacked, but they drop nothing. To the east end of the church is an altar, which you can use to recharge your prayer points. This church is a feature in the quest Devious Minds. Upstairs is an Organ, which you can play. Also up there are two attackable Monks. 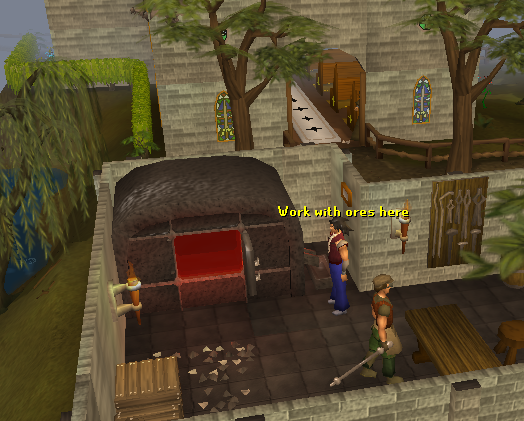 This furnace is handy for crafting, because you can make molten glass easily here, using the Crafting skill. Also in this area is Fritz the Glassblower, and he will tell you about glass blowing if you ask him. This house is particularly helpful, because of two things. The first being it contains a glassblowing pipe, and the second being it has a range. The glassblowing pipe can be used to make glass items, and the range is helpful for cooking seaweed, which makes soda ash. Soda ash can be used to make molten glass. All of this stuff is helpful because it raises the Crafting skill. Other things in the house include a study desk and outside in the garden are some potatoes, which can be picked. 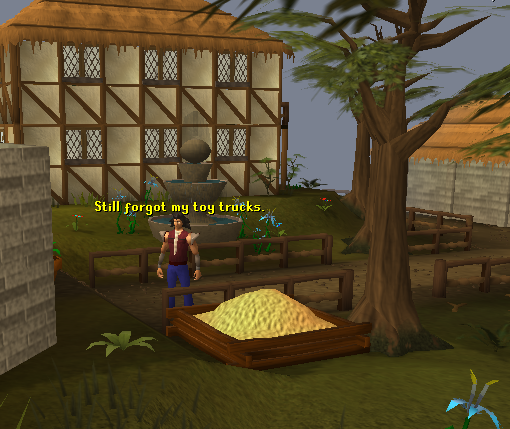 Around this sandpit you can find the NPC Mazion, who is featured in the Hand in the Sand quest. The sandpit is useful for Crafting, because a bucket of sand is one of the ingredients that makes glass. Simply use a bucket with the sandpit to retrieve sand. West of the sandpit is a Herblore shop. It sells many things needed for the Herblore skill, like vials, pestles and mortars and eyes of newt. Inside the shop are also two vial respawns. South of that shop and southwest of the sandpit is a hops patch. If you have something growing, Francis the gardening Monk will look after it for a price. This is the place on Entrana where you can fish, using the Fishing skill. There are four fishing spots, each one is net and bait. Inside a small building to the west is a fishing rod, which you can take, and a range, which you can cook on using the Cooking skill. The range is also very helpful because you can cook seaweed on there, which is used in glassmaking. 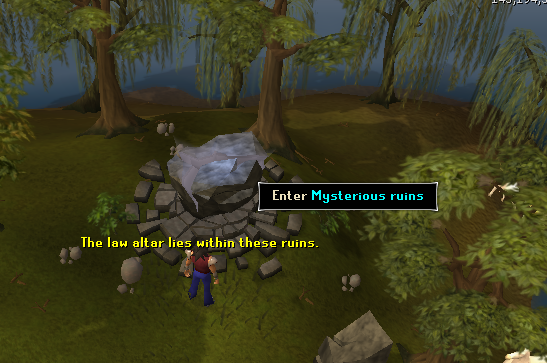 Here you can craft law runes, using the Runecrafting skill. 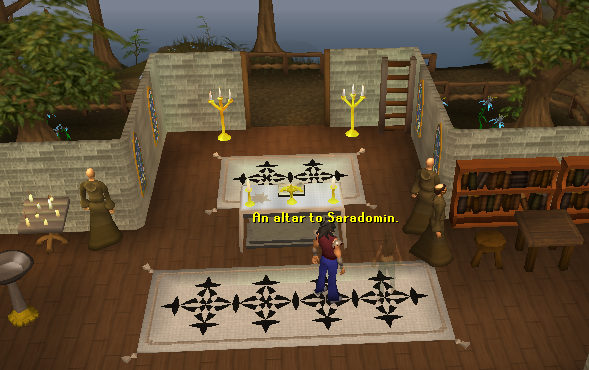 You can enter the altar using a Law talisman or tiara that is obtained from the quest Troll Stronghold. Another way to get in is via the Abyss, but you can't take weapons or armour with you. You'll need pure essence to craft at the altar. If you are on world 66 or 99, you can use the Fast Free Laws company, and get free law runes. This place isn't very important, but it does have some use. 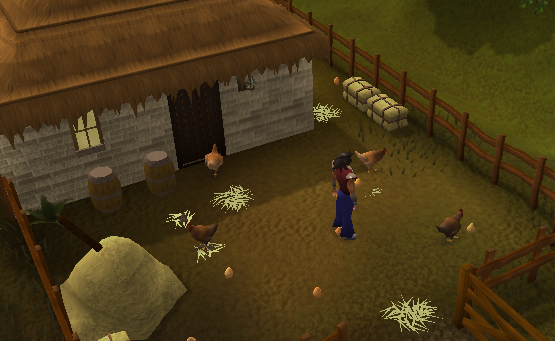 You can kill chickens, collect their raw bodies, and cook them inside the nearby house. Also inside the house is a free kebab, which you can eat to heal some Life Points. If you are lucky you can search the Haystack and find a needle. 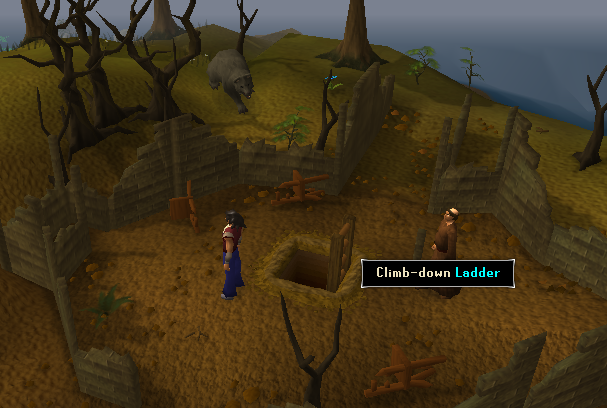 This ladder leads to the dungeon, which is used in the quest Lost City. If you talk to the Cave Monk he will warn you of the dangers. To the north west of the ladder is a seaweed respawn. You can cook the seaweed to make soda ash, which is essential in glassmaking. This place is the start quest point for the Enlightened Journey quest. 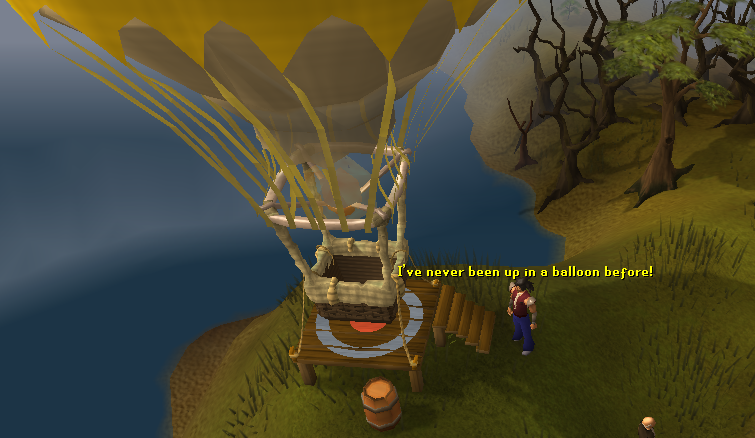 You can travel in the balloon to the Grand Tree, Castle Wars, the Crafting Guild, Taverley and Varrock. Each location requires a certain number of logs, and you will get Firemaking experience for traveling on the Balloons.